In order to deploy the Geocortex Mobile App Framework for iOS within your organization, you require an Apple Enterprise Developer license. The license provides a safe and secure channel for distributing the application to your users. See Create an Apple Enterprise Developer Account for instructions. The Geocortex Mobile App Framework for iOS supports iOS 9.0 and newer on tablets and phones with at least 1 GB of RAM. We recommend iOS 10.0 or newer. The network log feature requires at least iOS 10. The 3rd generation iPad only supports iOS up to version 9.3.5.
iOS does not support ZIP files. To use Export features that produce ZIP files in iOS, you must install third-party software to handle ZIP files, such as iZip. If Internet Information Services (IIS) is configured to deny anonymous access for either Essentials or the HTML5 Viewer, the Geocortex Mobile App Framework may not work properly. We recommend using ArcGIS Enterprise or ArcGIS Server rather than ArcGIS Online. As of 2016, ArcGIS Online can support approximately 20 concurrent synchronizations, depending on the data. Using ArcGIS Enterprise or ArcGIS Server, you can scale your server resources to handle the number of concurrent synchronizations that your organization needs. If your site uses secured services, see Types of Security Supported in iOS. As of version 1.3.2, the Geocortex Mobile App Framework makes use of the HTML5 Viewer proxy page. You must configure the HTML5 Viewer proxy page to communicate with trusted servers such as the Essentials server, otherwise the application may not function properly. For more information, see Set Up a Proxy Page for the HTML5 Viewer. Do not use the proxy page for user access control because some Geocortex Mobile App Framework requests are not routed through the proxy page, for example, offline map downloads. The proxy page is only used to facilitate cross-domain activity between the device and servers. If you want to enforce user access control for your GIS services, consider using a reverse proxy for your GIS services instead. The Geocortex Mobile App Framework requires cross-origin resource sharing (CORS) with Geocortex Essentials to function properly. You can set up CORS in Essentials Manager. Essentials 4.5 and newer support the Geocortex Mobile App Framework out of the box. If you have configured CORS in Essentials before version 4.5, you must first remove the legacy CORS configuration. For instructions, see Set Up Cross-Origin Resource Sharing (CORS). Certain offline features require the App to be licensed using an ArcGIS Runtime SDK license. Basic: Allows users to use offline basemaps, global search, query, filter, identify, and view related features offline. The Basic license does not allow users to do offline editing. Standard: Required for offline editing. As of version 2.0 of Geocortex Mobile App Framework, offline editing uses Esri's Replicas technology, which requires a Standard license code. For more information, see Obtain an ArcGIS Runtime SDK License. The site must have at least one editable layer. The ArcGIS feature services must have the sync capability enabled, the Global ID field added to the data, archiving or versioning enabled on the data, and relationships and attachments configured with a Global ID primary key. If versioning is enabled on your data, ensure you register your data without the option to move edits to base. For more information, see Prepare data for offline use in Esri's documentation. To support running workflows offline, the Geocortex Viewer for HTML5 server must have an internet connection. The Geocortex Mobile App Framework must be installed on each end user's device. The preferred way to make the installation package available to users is to deploy it to a web server that users have access to. They can then download the package from the server and install the App on their device. Note that the web server must use SSL. To allow end users to download the installation package from a web server, you can use any web server capable of serving .ipa, .plist, .tpk, and .json files. If you use Internet Information Services (IIS), you will need to add MIME types for each of these file extensions. Follow the instructions below. To open IIS Manager, click the Windows Start button, type iis, and click Internet Information Services (IIS) Manager. In the Connections panel, expand the hierarchy and select the item in the hierarchy where you want to add the MIME types. You can add MIME types at any point in the hierarchy. The higher in the hierarchy you add the MIME types, the greater the scope they have. Selecting the website where Essentials and the HTML5 Viewer are deployed is sufficient. By default, Essentials and the HTML5 Viewer are deployed to the Default Web Site. In the IIS section of the middle panel, double-click MIME Types. In the Actions panel on the right, click Add. 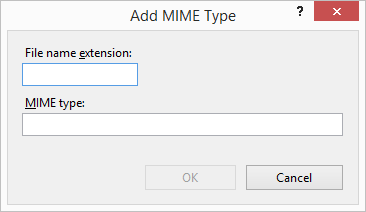 The Add MIME Type dialog box opens. Type the file extension in the File name extension box. Type the MIME type in the MIME Type box. The Add MIME Type dialog box closes. Click OK and close IIS Manager. As of version 2.2, the Geocortex Mobile App Framework for iOS no longer supports Windows Authentication for ArcGIS services due to an iOS performance bottleneck. Use token security instead. The following table shows the types of security supported by the Geocortex Mobile App Framework and Geocortex Essentials Manager. * iOS 10.3 or greater requires at least a SHA-256 certificate on the Geocortex Viewer for HTML5 server; SHA-1 certificates are not supported. † Portal-tier authentication has been tested with the built-in identity store for sign-in. Enterprise identity store, Enterprise logins, or Security Assertion Markup Language (SAML) have not been tested. ‡ Essentials (and Portal for ArcGIS, if relevant) are SSL/TLS secured. Two-level security with map services in Essentials is only supported for users authenticated with the application pool identity.